People say that some foods grow on you. Or you have to gain an appreciation for certain flavours. This was the case for me with mussels. When I was younger, mussels were something that I never thought I would like. I tried them many ways but could never find a style that I really like. Eventually, after many attempts, I finally found a way to serve them that I liked. There was no magical moment. One day I tried them with a great tomato sauce and thought, “hey, this is pretty good.” Now mussels make a regular appearance at my house. Even my two-year-old likes them — which is great since they are one of the best sources of iron. I also love to make them when I have people over. They are a show-stopper with guests and many think they are harder to make than they really are (shhh, don’t tell anyone). Mussels have turned into a great meal for myself, my family and my friends. And it all started with nailing the tomato sauce. Place large pot over medium heat. Add olive oil; when heated, add onion. Sauté until onions becomes translucent. Add garlic and sauté an additional minute. Add wine to deglaze the pan. Add tomato purée, half the parsley, pepper and Sriracha (if using) when the wine has evaporated. Cook tomato base for 3 minutes. Add mussels. Stir and cover with a tight-fitting lid, and cook for 10 to 15 minutes until all shells open and mussels begin to turn pink and firm. Discard any mussels that did not open. 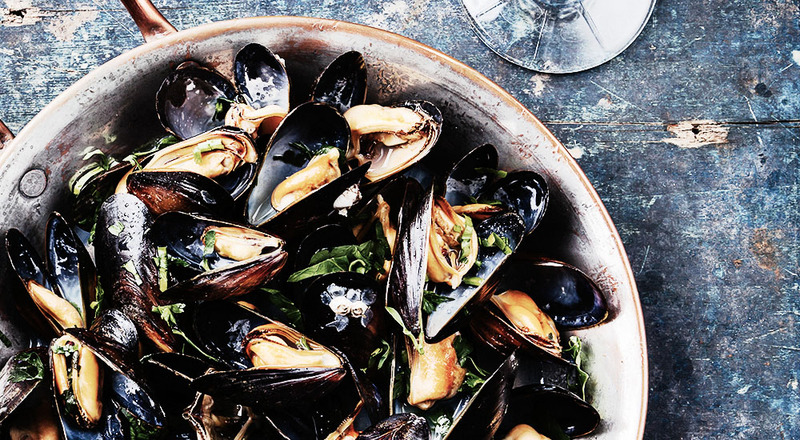 Sprinkle remaining parsley over mussels. Match: I prefer a dry Riesling from Alsace, but a New World Sauvignon Blanc will work also.